Elizabeth Taylor was interviewed a while back on the program Good Morning America. In the interview she told of her 6 week stay at a rehabilitation clinic where she had been able to kick a 25 year drug habit. One of the things which most impressed her was how the residents shared not only their problems, but also their common chores. Her tasks every day were to take out the garbage and hose down the patio. Since becoming a box office star at the age of 12 and being one of the highest paid actresses of all time, it is doubtful she had ever performed those menial tasks I do every Thursday morning. What was fascinating about the interview was that Ms Taylor saw her servant role as being the most therapeutic thing she did at the clinic. Her insight into the joy of service is indeed the very one that Jesus seeks to convey in the moving scene of foot-washing in John 13. Note in verse 1 the setting of this humble action. Jesus knows the hour has come for him to die. How gently John puts it. The hour had come for him to leave the world and go to the Father. He would leave the world soon, but only after certain things had happened. He would be betrayed by friends and by the judiciary. He would be tortured, assaulted, whipped, and nailed. So he would leave the world as a beaten, broken, crucified body. How ironic that the verse having spoken about his departure then goes on to talk about love. We might expect vengeance or anger, but John, the beloved disciple, speaks of his love. He had always loved those who were in the world who were his own, and he loved them to the very end. Not even the events of his death, his betrayal by those were his own, would undo that love. He loved them to the very end. Neither do our stupidities, mistakes, elected sins, and selective unbelief undo that love of Jesus. He loves us to the very end. Amidst that love, there was betrayal. The Devil betrayed the truth by putting thoughts into Judas’ head. Here the Devil suggests thoughts, however, in verse 27, Satan actually enters Judas. The sinful disposition attracts sinful options that the Devil is only too happy to spell out. Co-operation with Devil leads to a take-over, and Judas acts on this Satanic impulse. The thought becomes the action. Satan is a predator on the human frustration, and urgency which seeks some other way ahead apart from an obedient waiting on God. Betrayal is followed by assurance. Jesus has the power to live through human betrayals. He knew he had come from God, and was going to God. Do we know that? Have we discovered the purpose and meaning of our lives? Do we know our origins and destiny are in God? Do we know that our life, like all human life, is a precious gift of God? Our destiny is one beyond anything this world can offer. The basis of a meaningful life is to know our origins and our destiny. In verses 4-5, Jesus begins to wash his Disciple’s feet. People tell me that to walk in Palestine is to be either coated with dust or to be wading in mud. Hence in Jesus day, a host always had a large bowl of water available. The servants would wash the feet of the guests. Here apparently, no-one had done that simple task. No Disciple had offered to wash Jesus’ feet or anyone else’s. So Jesus, on the night he was betrayed decided to wash theirs. He takes off his garments, garments that within hours would be ripped from him and gambled for at the foot of the Cross. Jesus voluntarily disrobed so that he could better serve his Disciples. I am not sure how I would have acted if this was my last night alive. But I have a hunch it would not involve washing other people’s feet. I’m pretty sure I would bemore concerned with my own welfare and comfort than any one else’s needs. Would anyone be any different? Yet Jesus serves, washes and dries. Humility and false humility compete in us like Jacob and Esau. Would we let Jesus wash our feet? We are quite happy to serve Jesus, he is worthy of that, but he disarmingly insists on serving us first. To Peter’s false humility, comes Jesus’ sharp rejoinder, ‘If I do not wash your feet then you will no longer be my disciple.’ In other words, if you do not have the humility to receive the gift of myself and my service, you will never make a disciple. 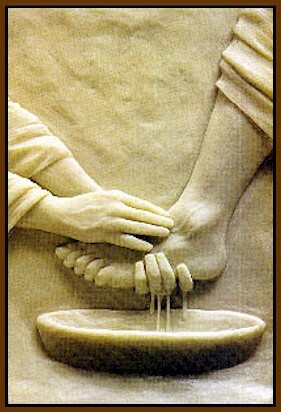 Hence the foot-washing really symbolizes Jesus’ death for his people. It is a death which will bring them cleansing, a death they enter into by baptism and faith. As the waters of Jesus love bathe their feet, so must his baptismal waters bathe their souls. So too we must both believe and be baptized if we are to be his disciples. In verse 9 Peter swings to the other extreme. He wants to be totally washed by Jesus, his hands and his head also. In verse 10 Jesus makes a cryptic, slightly puzzling reply. ‘Anyone who has had a bath is completely clean and does not have to wash except for his feet.’ What does that mean? Before a feast, it was customary to bathe. When a guest arrived it was not necessary to take another bath, but simply to wash his/her feet. It means then that if Peter will bathe in the victory of the Lord’s Cross, then he has been cleansed. In other words, the Lord’s death makes him and us clean. Jesus has served humbly, and we ought to do likewise. He will soon serve supremely by going to the Cross. This he foreshadows in giving himself in humble service. Do we accept Jesus example? The text reminds us that our first responsibility as a Christian community is to care for our own people. It’s not to stop there, but it starts there with washing one another’s feet in the many ways we can serve within the church. Love one another is the basis for loving our neighbor in service and evangelism. Let us then take special care of each other, for that is following Jesus example of sacrifice and service.